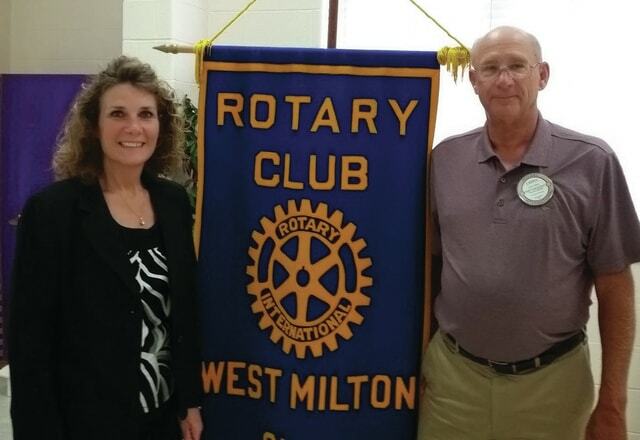 WEST MILTON — Larry Dehus, program host, provided the program for the May 18 West Milton Rotary Club meeting. Larry organized our Paul Harris Fellow drawing for the year and he began by giving the Rotarians a review of the history of the Rotary International Foundation as well as the Paul Harris Fellow award. The mission of the Rotary Foundation is to enable Rotary members to advance world understanding, good will, and peace through the improvement of health, the support of education and the alleviation of poverty. The Foundation is a not-for-profit corporation supported solely by voluntary contributions from Rotary members and friends of the Foundation who share its vision of a better world. This support is essential to make possible projects, funded with Foundation grants that bring sustainable improvement to communities in need. The key goals are to seek world peace and world understanding and to help improve communication among countries with less conflict. The foundation provides gifts to many charities with the purpose of doing much good for the community/area or world. In 1929, the Foundation made its first gift of $500 to the International Society for Crippled Children. The organization, created by Rotarian Edgar F. “Daddy” Allen, later grew into Easter Seals. When Rotary founder Paul Harris died in 1947, contributions began pouring in to Rotary International, and the Paul Harris Memorial Fund was created to build the Foundation. The Paul Harris Fellow recognition acknowledges individuals who contribute, or who have contributions made in their name, of $1,000 to The Rotary Foundation of Rotary International. It was established in 1957 to show appreciation for and encourage substantial contributions to what was then the Foundation’s only program, Rotary Foundation Fellowships for Advanced Study, the precursor to Ambassadorial Scholarships. Polio eradication is Rotary’s top philanthropic priority. When Rotary launched the PolioPlus program in 1985, there were more than 350,000 polio cases in over 125 countries. Since 1988, when Rotary began working with its partners in the Global Polio Eradication Initiative to immunize more than 2 billion children, the incidence of polio has decreased 99 percent. As of 2013, Rotary’s contributions to the global polio eradication effort totaled $1.2 billion. For the local drawing, ten Rotarians donated $100 each to provide the $1000 donation to the Rotary Foundation to receive a Paul Harris Fellow award. In reverse order drawing, the person’s name NOT drawn was the winner. The other nine would get credit toward their own Paul Harris Fellow once they reached $1000 over a period of years. Thanks to the following Rotarians for participating this year: Vicki Blei, Matt Gingrich, Bob Johnston, Matt Kline, Chris Long, Jon Neitzke, Ginny Rammel, Jim Sarver, Allen Smith and Randy Yoakum. The winner and recipient of the Paul Harris Fellow was Allen Smith.